Two late goals turned defeat into victory, despair into delirium, and spared Raith Rovers from another derby post-mortem. Heading into the 87th minute at Bayview, East Fife led 1-0 thanks to Kevin Smith's first half opener, and Raith's unhappy travelling support were ready to vent their anger as their team stared down the barrel of another away setback, and a third straight defeat at the hands of their part-time local rivals. Fast forward two minutes and those same fans were jumping for joy having watched Rovers score not once, but twice, as Iain Davidson's leveller was quickly followed by Kevin Nisbet's winner, sealing Rovers first away win of 2019, and breaking the hex held over them by the Methil men this season. Having dropped eight points to East Fife, including a last-minute decider in the previous meeting at Bavyiew, this was payback for the Kirkcaldy side. More importantly, if Raith have serious play-off aspirations, then this was a match where they simply had to show their mettle, and the manner of victory, as well as the celebrations afterwards, will go a long way towards galvanising players and supporters for the promotion push. Given the timing of the goals it can be considered a smash and grab, but Rovers put more than enough effort into the second half to deserve something from the game, albeit after a largely mediocre first half. Rovers starting encouragingly, making all the play in the opening 10 minutes and Jamie Barjonas was unlucky not to open the scoring after an excellent one-two with Nisbet sent him clear into the box, but Brett Long made a smart save. Then, as this Raith team tends to do, they switched off and East Fife took over. All the bad memories from the three previous derbies came flooding back as the home side were playing at a higher tempo, and generally showing more eagerness all over the park with Rovers giving the ball away countless times, particularly down the channels. A number of important interceptions and blocks, particularly from Davidson, were required to keep the home side at bay, but the defence wilted on 40 minutes when right back Aaron Dunsmore was allowed to run 50 yards, all the way into the Raith box, to the by-line, before cutting the ball across goal for the unmarked Smith to tap home from one yard. By all accounts, John McGlynn and Paul Smith let rip at their players during the half-time interval, and there was a positive reaction in the sense that Rovers regained control of the match, but there remained considerable frustration at the lack of chances being created. 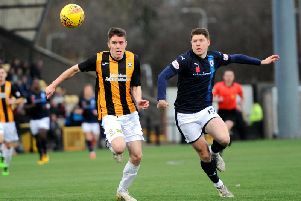 The narrow system that had destroyed Dumbarton the previous week was, on this occasion, stifling Rovers attempts to get back in the game as they struggled to find any space against an East Fife side that had retreated into a defensive mode. Full backs Grant Gillespie and Calum Crane were having a particularly difficult time picking out blue jerseys due to the lack of options down the line, and McGlynn's decision to bring on two wingers in a double substitution with over 20 minutes left was a game-changer. Craig McGuffie, and in particular Nathan Flanagan, made a positive impact as Rovers finally got down the sides and sent deliveries into the box, with Flanagan's terrific cross to the back post on 82 minutes met by a Nat Wedderburn knock-down that was scrambled clear for a corner. For all their huff and puff, it was the first time Raith had genuinely threatened to score since half-time and the team took a lift. McGuffie then sent a corner to the back post which Davidson powered back across goal only for Daryl Meggat to head clear off the line. Raith now looked capable of scoring an equaliser but with time running out they needed a hero, and Davidson stepped up from the back to provide one. The home-town player who tends to have a love-hate relationship with the support will be the toast of Kirkcaldy tonight as he controlled Flanagan's cross at the far post, before drilling a half-volley across goal which nestled inside the far corner of the net. An exceptional finish for a 35-year-old centre-half. Relief at the leveller quickly turned into a thirst for victory - exactly the type of passion the Rovers fans want from this team - and they were straight back on the attack with McGuffie forcing Long into a diving save with a powerful shot from the edge of the box. East Fife cleared but could not escape their half, and when the ball was returned to the box, Euan Murray crashed a header off the crossbar, and emerging through the crowd of bodies came Nisbet to nod home the rebound for his 29th goal of the season to spark bedlam in the away end. The booking for taking his shirt off in celebration was one he was glad to accept. It meant that much. It shouldn't have taken Rovers until the dying minutes of the fourth and final fixture to finally get the better of East Fife this season ... but it was worth the wait.